Knotted Cotton: Not Fresh Sewing Day! Stuck in a bit of a creative swamp at the moment. Came across this the other day. I think this is the original source. I have more than one reason for not being very productive in the quilting sense. As well as the creative swamp I'm occupied with this one. I'm digging out the unsuccessful lawn in order to put down pebbles. 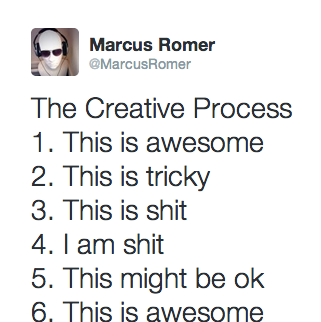 Now that I've excavated nearly 60 sacks of mud, I think I'm at stage 5. Onwards and upwards! Ah-ha, Catherine! Thank you for pointing out my problem. I am, apparently, mired between #3 and #4! so funny! Why do we doubt ourselves so much? I was just thinking today that I want to dig up the grass in our tiny back garden and pave it. Grass just means that it is full of mozzies and so we never sit out there, and at the moment it is so muddy because of all the rain. So funny! and I have to admit I feel like that many times... Your garden project is going to be amazing. The pebbles are going to look great. So very apt! And how cute is your garden! Can't wait to see it with all the stones. huh ... what was wrong with the garden? too wet? not enough draining after a rain? it's sad that you can't have grass there anymore it's so much nicer to walk barefoot on ... well anway Good Luck with your garden - maybe you should just put in some stepping stones and keep the rest as "swamp" I'm sure there are a lot of swamp flowers (annual and perennial) and grasses out there that would love your swamp. Work with what you get not against it. Definitely sums things up Catherine we should all have that pinned on the wall above our sewing machines! Hope your weather is better than ours at the minute to let you get on with that hard labour in the garden. Thanks for your visit to my blog Catherine, so we are both tackling our gardens this year. You have scared me now 60 sacks of mud, good grief ... I am replacing a lawn this year and I haven't started yet. My lawn is compacted, weedy and it has concrete footings under part of it. There used to be a porch, before I lived here, and a shallow layer of soil was placed over the footings and the grass obviously fails to grow there. It will be good if you and I can cheer each other on .... I just have to keep in mind the end result. It will be worth it .... hard work though. Good luck with project garden, I've jsut moved home and am lookign forward to getting my hands dirty again with veg growing (hard work as it is) it will be so worth it in the end. Maybe we can compare notes. Loved this post! I'm currently fighting with a quilt on the design wall right now. I think I'm just emerging from stage 3! I've switched up some of the fabrics and I'm happier but still not ecstatic. I'm at the "I think I'll just pretend I'm a pioneer and have to use the fabric I've got stage. Your yard is going to be amazing. Mine is still half covered in snow. Love the creative process. Find myself in all these stages from time to time. I should print it and put it on my work desk, it will make me smile and remind me that I am not the only one. :-) 60 sacks of mud! That's a lot! Looking forward to seeing you in stage 6. I am sure your garden will look awesome!